The Kindergarten children at Montessori Children’s House in Blue Bell sponsored a Thanksgiving Food Drive to benefit the Mattie N. Dixon Community Cupboard in Ambler. The Community Cupboard was founded by Mattie N. Dixon, a longtime resident of Ambler and a true visionary. In response to learning that people in her community were going hungry, she started serving families out of her basement in 1973. Today, the Cupboard is a 501(c)3 non-profit organization that has been meeting the needs of local individuals and families whose incomes fall at or below the Federal Government Poverty Guidelines for over 40 years. 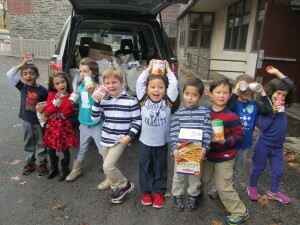 The families of Montessori Children’s House in Blue Bell contributed a total of 139 pounds of non-perishable Thanksgiving food items to the Cupboard. “Some people don’t have enough money to buy food. “ a Kindergarten child explains, “They can’t have a warm dinner so we’re going to give them a warm dinner.” The Kindergarten children packed the donated food and loaded it for delivery to the Community Cupboard. « Horsham Montessori Receives $1,000 Grant!